Binary Digital Image Processing is aimed at faculty, postgraduate students and industry specialists. It is both a text reference and a textbook that reviews and analyses the research output in this field of binary image processing. It is aimed at both advanced researchers as well as educating the novice to this area. 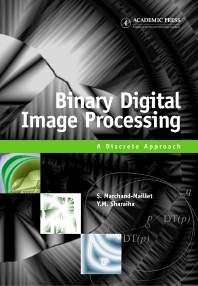 The theoretical part of this book includes the basic principles required for binary digital image analysis. The practical part which will take an algorithmic approach addresses problems which find applications beyond binary digital line image processing. The book first outlines the theoretical framework underpinning the study of digital image processing with particular reference to those needed for line image processing. The theoretical tools in the first part of the book set the stage for the second and third parts, where low-level binary image processing is addressed and then intermediate level processing of binary line images is studied. The book concludes with some practical applications of this work by reviewing some industrial and software applications (engineering drawing storage and primitive extraction, fingerprint compression). Foreword. Acknowledgements. Notation. Preface. Digital topology. Discrete geometry. Algorithmic graph theory. Acquisition and storage. Distance transformations. Binary digital image characteristics. Image thinning. Some applications. References. Index. Stéphane Marchand-Maillet is affiliated with the Department of Multimedia Communications at Institut Eurecom, Sophia-Antipolis, France - a consortium between academic and industrial partners. Yazid M. Sharaiha received his B.Sc. (Eng) and PhD (1991)from Imperial College, London. He also holds Master degrees in Engineering (1987) and Management Science (1988) from University of California, Berkeley and Imperial College respectively. He was a University Lecturer in Information Management at Imperial College from 1991 to 1997. He is currently a visiting fellow at Imperial College and working in Quantitative Strategies at Morgan Stanley Dean Witter. His research publications and interests include combinatorial optimisation, graph theory, computational geometry, and their applications in image analysis, scheduling and financial modeling.